With 4th of July approaching, I thought it appropriate to highlight a piece of ag that one of our founding fathers helped promote–tomatoes. I absolutely love tomatoes. Sadly, our garden tomatoes are not doing well, and I have yet to have a tomato sandwich with homegrown produce. Sad days, I know; however, I can find comfort in the fact that tomatoes are a popular food and no longer thought to be poisonous. How in the world such a wonderful food could be feared is beyond me, but thanks to a few individuals, especially Thomas Jefferson, tomatoes are now celebrated and devoured. During Colonial times, folks related tomato plants with the poisonous nightshade plant, and only grew tomatoes for ornamental purposes. Not everyone was so paranoid about the plant, though. In South and Central America, where tomatoes originated, people had no qualms eating them. In France, tomatoes were called pomme d’amore, or “apple of love,” suggesting that they were also loved, but some experts say that this name was mistaken for the Spanish words “apple of the Moors.” It is thought that the first tomato came from Peru. Interestingly, all parts of the tomato plant are poisonous except for the fruit. 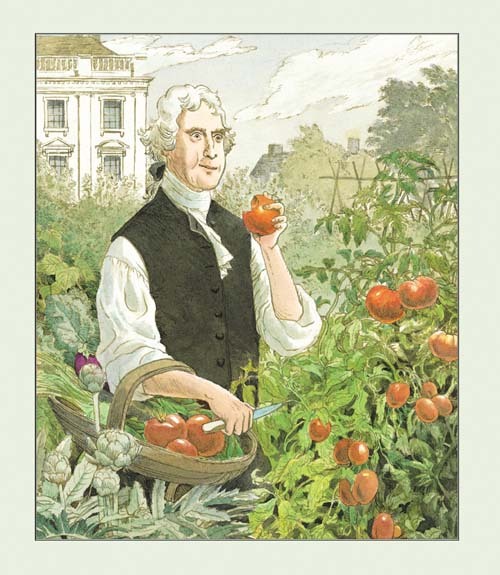 It took the efforts of Thomas Jefferson and his family to make the tomato go from feared to celebrated…well supposedly the Jefferson family is responsible for the tomatoes popularity. It is up for debate, but is generally accepted. Jefferson grew tomatoes in his garden where his daughters and granddaughters used them in all sorts of recipes like gumbo and pickling. When a prominent family like the Jeffersons use tomatoes (and don’t die of poison), you can well imagine that its popularity quickly rose. To set the record straight, tomatoes are fruits, but if you ask the Supreme Court of 1893, they were to be considered a vegetable. You see, there was a tariff on vegetables, but not on fruits. A tomato importer sued a tax collector on the basis that tomatoes were fruits and did not need to be taxed. Ultimately, the Supreme Court got involved and ruled that botanically speaking, tomatoes were fruits, but in layman terms they were vegetables. In addition tomatoes were eaten at dinner with other vegetables, unlike fruit that was typically eaten for dessert. So now, tomatoes have an identity crisis. The United States is one of the leading producers of tomatoes, only coming behind China. They contribute $2 billion in annual farm cash receipts according to the USDA. Tomatoes are grown for either fresh-market or processed. Those that are used for processed are machine picked while fresh-market tomatoes are hand picked. There are also several thousand varieties of tomatoes, and some are better for processing, while others are better for fresh-market. Fresh-market tomatoes are grown in all 50 states, and California grows the most tomatoes overall. It is definitely a far cry from the feared fruit of Colonial days. 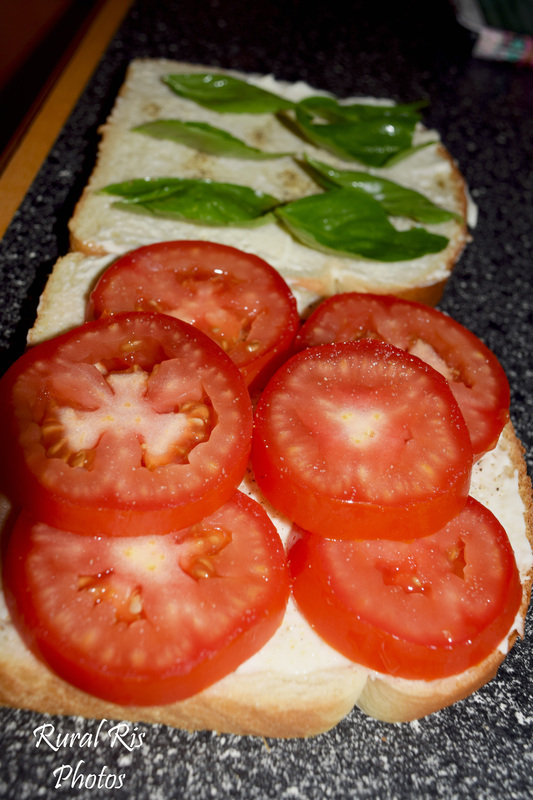 While I love tomatoes in everything and are one of my favorite snacks, one of my favorite ways to use them in the summer is to make a tomato basil sandwich. It is the simplest thing to go out to the garden (when it will actually grow tomatoes), grab a tomato and make a sandwich. All it takes is two slices of bread, spread with mayonnaise, salt and pepper, sliced tomato, and a few basil leaves. Bam! Quick, yummy, and definitely not poisonous! Thanks Jefferson!